For over 40 years, the Group has strengthened its presence on the Atlantic routes, in the process of becoming the leading Ro/Ro and container operator in the Atlantic Ocean. 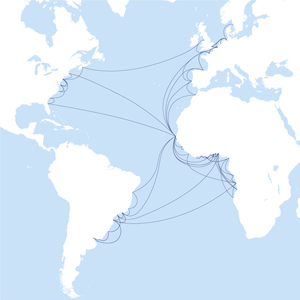 The routes served are: North America-West Africa, South America-West Africa, North Europe-West Africa, North Europe-South America, North America-North Europe (operated by ACL) and Mediterranean-West Africa. The Group offers weekly sailings from the main ports in North America, West Africa and Northern Europe, deploying a fleet of modern multipurpose vessels and Ro/Ro containerships.